I’m finding lately some articles that display a new term: learning experience design. Sometimes this term is used to convey some sort of evolution or progress; sometimes, it is used as something entirely different from instructional design. But let’s start with the instructional designer. To the best of my knowledge, the concept and actual translation to tasks of instructional design may vary across different organizations or companies. Sometimes it is just a pedagogical revision and enhancement of a piece of text or contents, in order for them to be more pedagogically feasible. Sometimes it comprises more tasks than that: storyboarding that pedagogically-enhanced content and chunk it in order to translate it to the authoring tool (for example, Storyline, eXelearning, Camtasia…). However, in some organizations instructional design also implies the actual creation with the authoring tool or even the late process of double checking everything in the LMS. A lot of different tasks under one umbrella term. Christopher Pappas (2013) tried to convey this with this infographic. Now let’s head on to learning experience designer. 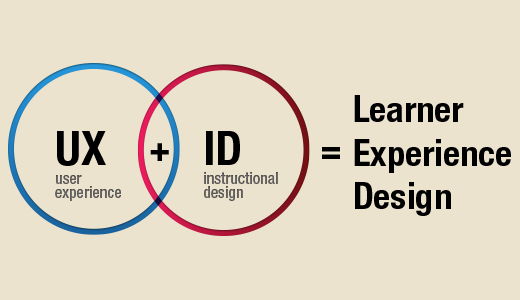 Apparently, a learning experience designer would have a wider idea than that of an instructional designer. Allegedly, they would focus more in the corporative vision of the institution they work for and less in a particular training, as well as linking the training with all the rest of training programs of the institution (Cammy Bean, 2018). Caroline Da Silva (2016) takes a similar stance, warning that instructional designers will be forced to redefine themselves as ‘instructional architects’, in order to enjoy a wider perspective of the organization, ‘involving the entire system’. Besides that, Niels Floor (2018) ventures a definition, which I directly took from learningexperiencedesign.com (oh yes, you have website for the term). A rather tautological definition, if you ask me, but if we keep on reading, apparently the gist of learning experience design is that it focuses on the learner and their process of learning, in a semi-implicit opposition to instructional design, which would focus on the instruction and the instructor. I feel somewhat shocked at this understanding of instructional design because one of the first tasks I do as instructional designer is to learn who and how are the students of a training. Lastly, Edsurge (2016), in an interesting article on the topic, proposes an analogy between a programmer evolving into a UX professional and an instructional designer evolving into a learning experience designer. The latter would do a lot more than managing an LMS and this whole new discipline articulates ‘graphic design, multimedia production, research-based standards and social media’. Personally, my opinion is that the concepts of learning experience design and instructional design, as far as I have read, are related more in a continuum than in separate boxes. The way I see it, learning experience design is the new buzzword for essential instructional design tasks plus additional tasks that, depending on the institution, can be regarded as a direct element or not, plus specialized knowledge from the UX area. Among the tasks that instructional design includes, at least writing from my own experience, is the design of proper interactions, which has a little of UX but not at the same technical level of a UX programmer. Maybe this is the most important nuance to take into account: the amount of technical knowledge of UX, which apparently is a key element in learning experience design. I am hardly the only one writing about these slightly different meanings. Holly MacDonald (2015), in a terrific article called Design Confusion, describes how there is a tendency towards mistaking e-learning design (and, thus, instructional design at least in some respect) with web design and denounces that having a visually powerful web is not the same as an e-learning course. This tendency towards overlapping would go hand in hand with another tendency in marketing and graphic design about creating visually beautiful things, casting aside other design precepts such as creating functional things. In any case, I like that Weigel considers social sciences and neuroscience as part of the definition of learning experience design, because I want to take them to the realm of instructional design. From my point of view, an instructional design should try to articulate what research in psychology and neuroscience has said regarding information processing, operative memory, recalling, psychometry (or how to correctly create a test), attention, etc., with a particular content in order to make it feasible pedagogically speaking. Thus, I don’t think multidisciplinarity is something alien to instructional design. I’ll venture a possible explanation for the creation of this new term. I’ll pinpoint the following agents as the one to blame: HTML5, framework for web and app designing and, generally speaking, several technologies that have made the web spectacularly more functional, more beautiful, more customizable and more usable. That, and also I have to add the rise of UX as a key asset in web and app design. These technologies have facilitated huge changes in how the webs are created and consumed. They have brought closer a democratization of the web, widening the number of businesses that provide services related to the creation and management of web-related services. Thanks to a friendly UX, now your average Joe can use a web app to create and edit content (using, for example a web app like Genial.ly, which won a prize recently; or Weebly or WordPress, for easily creating webpages). UX has reached such a wider audience that even some Spanish public administrations are starting to have usable webpages! Every time big tech companies change the interface of their products we see it on the news and some changes are influential enough to create a trend. Social web technologies have made us used to the idea that there are more people there on the web, to the likes and shares. I’m writing all of this to convey that UX is no longer something belonging to the highly qualified tech engineer. It’s an area of expertise that echoes in everyday life. As a result, UX doesn’t focus exclusively on building functional interfaces, but also on building usable and friendly experiences, intertwining technical development and web programming knowledge with that of design, oriented to solve functional problems that may arise to the end user. It’s interesting to watch this in apps, where UX is a key element to success. I can’t help to see the similarities with learning experience design. And I’m not referring to their similar acronyms of LX or LXD. The very same Weigel, aforementioned, writes that LXD ‘freely borrow from the user experience design thinking toolbox’ (Margaret Weigel, 2015). She also associates to LXD some parameters such as if the course is to be collaborative or not, the management of feedback for it to be effective or the branching or the content depending upon some variable. I have always associated these parameters with instructional design. Recent ways of content consumption (generally speaking and learning contents too): video is now a prevalent way of delivering training (read the Netflix model of training, in Spanish), we have micro-learning apps such as EduPills or Snackson. Regarding this topic, Scout Stevenson writes the following assertion in the blog of ExtensionEngine: ‘With the rise in educational apps, corporate e-learning and online degree programs, our UX team is faced with new and exciting challenges designing experiences that are focused on how people learn.’ There’s no possible misinterpretation here: UX people are the ones dealing with learning. Enhanced interfaces of some LMSs and of the whole web. It’s common (and relatively easy) for a web to have communication channels or social media integrated, to be highly customizable, with accurate feedback, with gamified interactions, etc. These user experiences are getting more frequent. Current authoring tools that have caught on this trend. For example, Rise, from Articulate, uses predefined content templates where user experience comes very polished as a default, as if they where predefined templates for web design (eg., accordion, carrousel, video container…). I wrote earlier on this post that I saw a continuum between instructional design and learning experience design: the UX specialization (assuming that LXD = Instructional design + UX). But, on top of that, I see LXD as a way of getting some distance apart from how things used to be, regarding both UX and instructional design, in a traditional e-learning setting. For this, I thank you, LXD. And welcome! We’re already tired of such e-learning (read an awesome article on this, in Spanish). I can’t say I’m convinced enough for considering it a completely separate discipline (we instructional designers already took into account user experience and interface and other practices that are being associated with LXD), but I celebrate its coming and I hope we get more articles on LXD. Read the original Spanish version here.